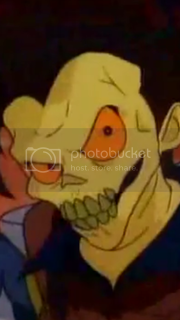 Prior to the release of the Time Life DVD collection in 2008, Ghostheads had only seen the original promo/pilot animation of The Real Ghostbusters in segments, and extremely low quality. With the DVD set, fans were treated to an uncut version of the animation, however the quality was still somewhat fuzzy as it was a transfer of a cassette recording. 9 years later and Ghostbusters fan Robert Barbieri has unveiled some exciting news: an original film reel for the pilot/promo animation has been discovered, and as the screenshot above shows, the quality and clarity it will provide is a major step up from what we've previously seen. According to Robert, the reel has already been scanned in and is being digitally restored in preparation for streaming on Facebook at a future date. That's pretty amazing. Finds like this are always pretty exciting. Here's hoping somewhere out there is a full recording of the theme out there somewhere. I just saw this on Facebook and I am very excited to see it in higher quality. I still remember seeing it on HBO for the first time, unprepared, and being blown away by it. I only saw it one other time, bagging the end part of it on VHS (and then I accidentally taped over the very end due to backroll) but watching that clip over and over always gave me a thrill. It was great to see it in its entirety again on the Time-Life release, but the thought of seeing it in pristine quality? Wow. Quality looks great! Can't wait, I'm already almost done binging The Real Ghostbusters on Netflix. Trap em all. Let Egon sort em out. Great work! Now if only we could get RGB remastered in HD. That's not possible unless they have the film reel. The DVD sets used tape masters, which was the best thing they had access to. Most cartoons in the 80s and 90s transferred to tape masters, and the film reel is usually discarded. Things like this are what make the community great. Awesome! This is great news, looking forward to seeing the pilot in a higher quality presentation. The pilot is one of my favorite features on the Real Ghostbusters DVD set from Time Life. It is amazing to see how the artists concepts of the characters, ghosts and equipment were when the deal with ABC was made. Interesting date on the reel. The first episode of RGB aired on September 13, 1986. I think the pilot was finished around June that year? Can't wait to hear a bit more on the story of how this reel was found. Fun fact: a lot of TV shows still use tape, even ones broadcast in HD. I couldn't believe it when I saw that they have what is essentially an HD VHS tape with the show on it that they then broadcast out over the airwaves. It's true. You'd think they'd convert to blu ray or something. But nope. All the TV shows were still on a VHS-like tape. I hope, nay, I PRAY Warner's kept the film elements to Batman The Animated Series. After seeing Mask of the Phantasm on blu ray, my body and soul NEED an HD Batman TAS. That show was so ahead of it's time that it's *still* ahead of it's time. The musical score alone...ugh. I could geek out over that show all day. Yes and this is exactly the case with Real Ghostbusters. If you take a look at Robert's Instagram page, he posted a picture of a film strip he acquired of a RGB episode. The story behind it was the original owner obtained it from the father of a classmate that worked on the show. I guess the father was there for show and tell where he gave each classmate a strip from a master of the show. That fact pretty much confirms that DIC destroyed RGB film masters. You're absolutely correct, unfortunately. It really is unfortunate that many things from film & TV are far gone. Wow, the difference there is really noticable! I've uploaded full HD video to Facebook and it has turned out fine. If they do upload at 720p that is concerning as it can't even begin to do justice to the film reel itself, however if it is a 16mm reel than 1080p would probably suffice. Does anyone know when we can expect to see this? He had hoped to have the finished restoration ready by Halloween, but it's been taking longer than expected. He's made progress up to the point where the skeletal pilot appears. He's currently planning to have a showing of it on Facebook, but doesn't have anything planned beyond that. The reel only features the visuals for the promo, and is completely silent. Audio will be supplied from the VHS copy of the promo, hopefully with some restoration. The reel, once restored, will be shown in 1920 x 1080, and whilst the quality of the restoration will be vastly superior to the version that appears on YouTube and on the TimeLife set, it will not be HD. If you don't mind my asking, do you know if it is being up-scaled to 1920x1080? If memory serves from what Robert told me, the frame scans he received were scanned to 1920x1080 scale. Scanning 1080 HD from 16mm or 35mm film is a piece of cake. The detail is there. This thing should look GORGEOUS. That's good to hear. I bet it looks amazing! anyone know the current status of this? Robert hasn't sent me any updates, and I've not noticed anything in my Facebook feed. Last teaser of the now FINISHED! lost film restoration of the Real Ghostbusters un-aired Pilot. 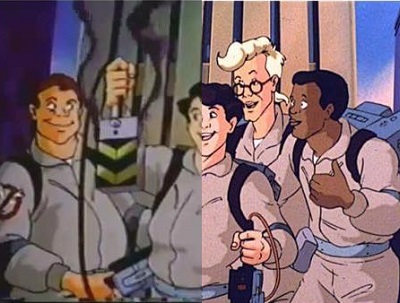 It was used internally to sell the concept of a Ghostbusters cartoon to ABC back in 1985. I took the original ABC Saturday Morning commercial from 1986 that's on youtube. It used only footage from the pilot, so i spliced in exact replacement footage from the restoration. It will be 1080, i reached out to Ghost Corps, a guy who supposedly is close to Ivan Reitman, gonna try to get an official DVD/blu ray release as a special feature or something, if not then i'll get it out one way or another. Real Ghostbusters Pilot restoration update. Nothing major but Ghost Corps responded to my email and after some talking they are going to fish the idea of an official release around between them and Sony and see what happens. I told them I'm not looking for legal trouble, I could of easily just posted on Youtube or someone else would of just kept the film as is on their shelf and the film would have degraded further. I also said I'm very easy to work with and as much honor as it would be to have my version of the restoration to be used, I said I would loan the film out if I would get it back. They can make a new film master if need be. Anyways fingers crossed everyone plays nice. 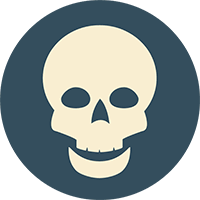 Quick update: Ghost Corps and Sony talks I'm letting simmer on the back burner since all they seem interested in is archiving the original film in a vault. Which is fine, but they have ignored all other questions about the restoration and release. Still researching and accepting leads/suggestions on free-affordable legal advice. I'm probably going to do a petition site to show the support for this to be released properly. So when I do that, if everyone can help share and sign that would be perfect. On a high note, managed to get the attention of the original director of this pilot and we have his support on trying to get the world of fans to see this in all its high quality glory. Does anyone know how to get ahold of the person who created the Suicidal STAY PUFT CGI video after watching GB16 on youtube? i tried contacting who i thought might be it but never got a response. I wanna try to get a happy watching video SP for the pilot. any help guys? Just keeping communication flowing to you guys no matter how insignificant. Artist of the sad CGI Stay Puft that i thought would be cool to do a happy version while watching the pilot is too busy. So i'll throw something together myself between photoshop and toys and video editing. If someone else does CGI by all means reach out. No word back from Ghost Corps/Sony after ignoring their email for over a week after they want me to donate the film. Apparently they are in no hurry. No word back from the Ghostbuster fan who is also a lawyer. I have a number to free lawyer advice from a Harvard Clinic that i'll call this week. Also, after getting some advice I purchased a vented plastic film container to let the original film breath while being protected in a cool room temp for good preservation. On the one high note, a member David Mattox is a local here in Orlando and is offering his services to do the Documentary for this Pilot restoration. Major bummer. Feels like this should be a fan-run project and release then donate to Ghost Corps after the fact or whatever.